A boy with a broken finger who quietly suffers under the weight of his father's cruel words. A girl desperate to fit in. The teenage boy who dates a girl in public and a boy in private. A young man who is counting the days until he's 21. A teacher struggling to get her students' respect. Read Between the Lines by Jo Knowles tells all these stories and more. The book contains ten short stories total, with each character's tale roughly 40 pages long. The storylines overlap and connect, woven together by setting - all of the stories take place in the same town, on the same day - as strangers, neighbors, relatives, co-workers and classmates interact, ignore, confront, and combust. Set aside some time for this book, because once you've finished reading it, you may feel compelled to read it again! 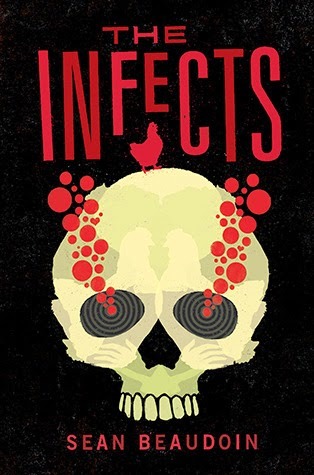 If you read this book a second time, you will pick up on even more of the connections, causes, and consequences, just like when you read a mystery for the second time, you pick up on more of the clues because you already know the identity (and intentions) of the murderer. The author said that this book was inspired by a stranger who flipped off her family while driving down the road. That symbol of disrespect is in each of the stories, which may make some parents or teachers hesitate, but don't be worried - overall, the book is fairly PG. 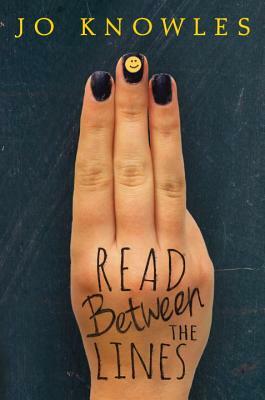 Read Between the Lines is both frank and considerate, honest in its depiction of emotional abuse, intolerance, secrets, and hierarchies within families, classrooms, and communities. Though they have different backgrounds and different interests, each character is trying to find a place for herself or himself in the world, and there's something universal in that search for identity and belonging. The point of the book is to pause, to think, to consider, to look, to look again: we don't always know what's happened to others to make them act or react the way they do; we can't read their minds, we don't know what their day has been like or what their home situation is, but if we take a moment to consider other people's feelings, to respect their space and hear their side of the story, we might be find we are more alike and more connected that we think. As if it isn't bad enough that Nick is being carted off to Inward Trek, a short term detention/reform excursion experience in lieu of doing time in juvie, but it just HAS to be the Zombie apocalypse as well. Nick has been stepping up lately working the night shift at the chicken processing plant in order to keep his family in their home, fed and his sister in her Asperger's meds. Dad - The Dude used to work R&D for the same chicken chicken company but that didn't really work out. As a reader, you start to pick up on the fact that things might not be quite right, especially the really strange way people are acting as all of the kids are being transported to the excursion site to start their "rehabilitation." Once the zombies start to attack though, it's time to find out who can lead, who follows, and who gets eaten. A fun zombie story with a little twist. No, they usually eat their fingers separately. Jaime’s funny, and it’s not a bad plan, except he has a huge case of stage fright. Like on stage, he forgets everything he wants to say. Every. Single. Thing. Offstage, Jaime’s life is full of jokes, his own and ones from the famous comics he’s read all about. But not everything about his life is funny. He’s living in a new town, trapped living with his aunt, uncle and cousin Stevie, who just happens to be the school bully. The same bully who is out to make Jamie’s life miserable. There’s a lot more that Jamie has to navigate in this book packed with jokes, including The Planet’s Funniest Kid Comic contest, a girl he likes that might just like him back, a yo-yo champion uncle who runs a diner in his new Long Island town, and his three best friends. What’s really fascinating about “I Funny” is that one of the main characters is disabled. And yet, that’s not what the book is about. And at the same time, it kind of is. Because we really get to know this character as a character, beyond their wheelchair. And that’s a great thing. Also, Jamie learns that there are different kinds of comedy, and there’s price to pay for jokes at someone else’s expense. This review comes to Guys Lit Wire from our friend Lee Wind. Read more of his reviews at his website. You're a 14-year-old boy with a cruel felon for an absentee father and an overly protective stripper for a mother. You live in a one-room home and feel badly outclassed and ostracized at the prestigious school you only get to attend because of an academic scholarship. You're bullied at school, henpecked at home, and even your friends turn out to just be using you until they can betray you. Mahatma Gandhi died more than sixty years ago but his life story is still relevant today. This simple man's story resonates even more today because many of the ills against which he fought are still with us and also because violence is now prevalent worldwide both by the oppressor and the oppressed. 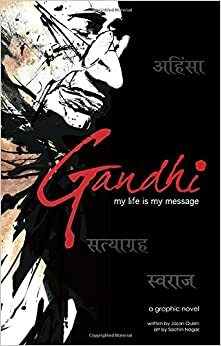 I read this graphic biography and was pleased to learn many things about Mohandas Karamchand Gandhi (his birth name). Mahatma was a name that his followers proffered on him (the word means "great soul") but he was not fond of it and was very embarrassed when he heard it used). The cover says it all: A snarling, snow-white werewolf with razor sharp teeth leaps over the frosty rooftops of a medieval town. This sums up the novel in my opinion - startling, dark and intense. 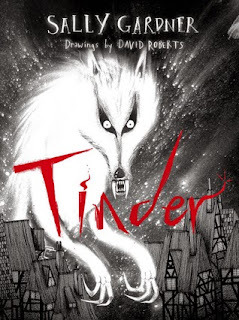 I'll start by saying that the artwork by David Roberts, which is sprinkled throughout Tinder, is very effective. Every drawing seems to emerge from the mist. They sneak up on you and before you realise what is happening, they've got their bony fingers around your throat. The story begins with 18 year-old Otto Hundebiss, he's a deserter of the Thirty Years War (1618 - 1648). His decision to flee comes after seeing a vision of Death cross his path. Lost in a dense forest, wounded and wrestling with a series of fever-dreams, Otto is rescued and nursed back to health by a mysterious shaman. Before releasing him, the shaman gives Otto a set of dice. As you'd assume, the dice aren't for the occasional game of Yahtzee, they are magic, and Otto relies on them to guide him through the entire novel. Traveling through Mitteleuropa, he stumbles upon Safire, a beautiful redhead who's also on the run from a group of dastardly soldiers. They meet and fall in love, but, as good stories go, Safire is taken away and Otto finds himself on a quest of madness and self-destruction in order to get her back. Labels: Fantasy , First Love , Flying Cars and Lost Cities , Mixed Media , War - What Is It Good For? There are a lot of good guy books here. Checking the index, I see six entries for author Walter Dean Myers and three for Gary Paulsen. The one listed for Daniel Pinkwater is the anthology Five Novels, so I'll cut editor Anita Silvey a break for that. She actually doesn't limit herself to 500 books -- many more are listed in the section "Beyond the 500: Additional Titles of Interest." 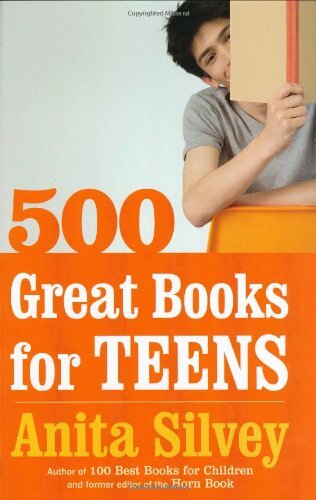 Many of the recommendations are books aimed at a more general readership, not just teens. That pleases me -- I think it's too limiting to say a book is for this age group, not that one. And "guy books?" Well, I see she recommends Toni Morrison's Beloved. There was this one summer when I discovered where they hid the bound comics in the library. This was back in the prehistoric days before the phrase Graphic Novel existed, when comics were considered "kid stuff." Ironically, these books were in the adult section of the library, historical artifacts from another era. Two in particular I went back to again and again: The collected Little Nemo in Slumberland and The Adventures of Tintin. Both of these comics shared a strong sense of line and color, in addition to being wild adventures of protagonists in outrageous settings. 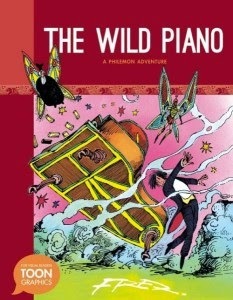 In a similar vein comes Toon Graphics' reprinting of the Philemon Adventures from French comic artist Frederic Aristides, who went by the pen name Fred. Phil, the son of a country farmer, discovers a message in a bottle in his well. This leads him into a watery passage that lands him on the letter A in the word Atlantic stretched across the middle of the Atlantic Ocean on a globe. As goofy as that sounds, Fred makes it work in a through-the-looking-glass sort of way. There he meets Bartholemew, the well-digger who vanished one day and and been trying to find his way home. And that's from the first book in this series, Cast Away on the Letter A that came out last year. Perhaps when you were young, you read some of Bruce Coville's books. Maybe Jeremy Thatcher, Dragon Hatcher or My Teacher is an Alien or one of the hundreds of other books he wrote. 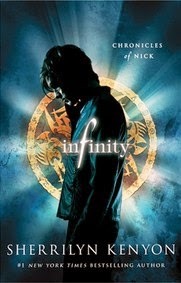 Perhaps you didn't know that he writes novels for teens, or retellings of Shakespeare plays. Or collections of short stories, like the ones in Oddly Enough,Odder Than Ever, or today's selection, Oddest of All. The book contains nine short stories, some that are decidedly science-fiction (as is the case with the first story, "In Our Own Hands", in which aliens arrive and make an offer to the inhabitants of a struggling Earth: They will give Earth the superior science it needs to fix all its ills - including curing illnesses and more - if Earth will vote to let the aliens have complete control until such a time as the people of Earth are ready to handle all the new ideas and technology they will receive. What would you do? Would you give up your autonomy if the entire planet could be cured? With a nod to prior stories like Frank Stockton's "The Lady or the Tiger", the story leaves the reader to ponder the question without knowing the precise outcome. There are contemporary stories of real life, as with the unfortunate events that befall Murphy Murphy when he reaches the age of 13 and Murphy's Law really kicks in for him in "What's the Worst That Could Happen? ", and horror in "The Thing in Auntie Alma's Pond." (It's way worse than a creature. Or is it?) And one of my favorite of Coville's short stories ever, "The Hardest, Kindest Gift", a retelling of the story of Melusine, a woman under a spell, or alternately, a fairy under a spell, who is the perfect wife and mother as long as she gets to spend her bath time uninterrupted. Too bad her husband doesn't honor his promise, cursing her to an unhappy half-life . . .
Then there's "The Mask of Eamonn Tiyado", something like an unfunny version of the movie, The Mask, or like a more thoughtful version of R.L. Stine's The Haunted Mask from the Goosebumps series aimed at an older audience, in which a boy trying to escape his own existence becomes trapped in a hideous world where his wish to look different is granted, but it comes at a terrible cost: he's got on the mask of an attractive young boy, but he cannot take it off, and there are "Faceless Ones" after him. "The Faceless Ones were my husband's victims. They were--had been--people born with great beauty but weak character. Or perhaps their character was weak because of their beauty, because it made life too easy for them. In any event, they were my husband's natural prey, and he was able to bring them under his power and steal their faces." Harley shivered. Against his will, his fingers crept to the handsome face now covering his own plain, pudgy features. "He stole their faces then sold them as living masks to men and women who were rich and royal but hardly fair of feature. The customer would go off on a journey ugly and months later return home with not only a new face but a new name, telling some story about being the favored first cousin--and heir--of the rich and royal man or woman who had died tragically while traveling abroad." Does the story end well? I leave it to you to read and find out. Sadly, the hardcover appears to be out of print, though you may luck into a copy at a library near you, but the book was recently released by the publisher as an e-book in all the various formats, and can be found at the usual online retailers. 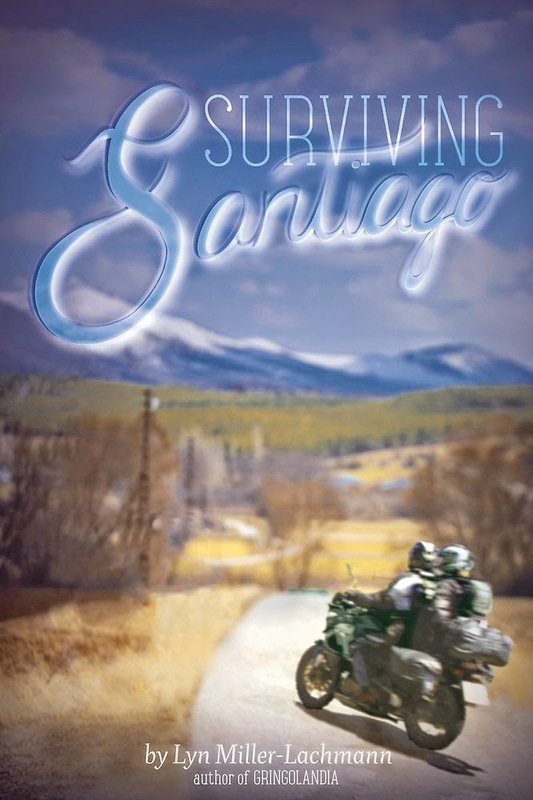 Surviving Santiago tells the story of Tina, a teenage girl who returns to Santiago, Chile, from America for a summer to live with her estranged and newly divorced father. Tina’s father was a revolutionary during the dictatorship of Pinochet, and his fight for his people’s freedom has left him broken, physically due to his injuries from beatings by the police, and mentally due to the tortures he has both witnessed and endured. Even though the Chilean people have ostensibly voted Pinochet out, the political situation in the country remains murky, and Papa continues to try and shed light on the activities of the government and military, drowning his anger in continued political agitation and alcohol, leaving little time to rebuild a relationship with Tina. 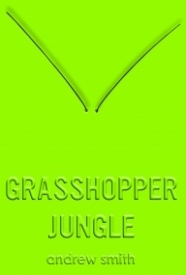 GRASSHOPPER JUNGLE is a history. All roads converge at the point of Austin Szerba's pen poised at the top of a blank page in a leather-bound log-book from the 70s, courtesy of McKeon Industries. 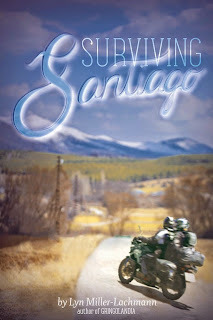 Austin Szerba, a cigarette-smoking Lutheran boy, narrates this post-apocalyptic journey of self-discovery and disaster. He is accompanied by his best friend, Robby Brees, and occasionally his girlfriend, Shan Collins, tags along for the ride. Austin thinks he might be in love with Robby Brees. Austin knows he loves Shan. It's all very confusing for Austin. Something special for you today - a peek at 1000 Miles of Passion. We are big European race fans around my house so when I saw this coffee table book was coming out, I had to share it. 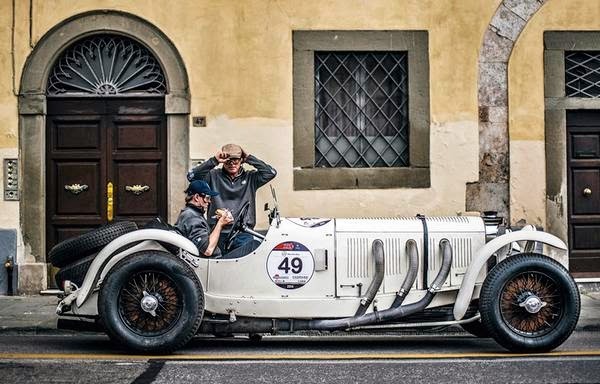 Originally, the Mille Miglia was an open road endurance race from Brescia to Rome and back. The route changed a bit over the years but since it's revival in 1977 it is now that first route. In a salute to its past, the modern race is limited to cars produced no later than 1957 who attended (or were registered) for the original race. I probably do not have to tell you how cool this race is. You can see the list of all the winners at Wikipedia - lots of Alfa Romeos and Ferrari (no surprise). 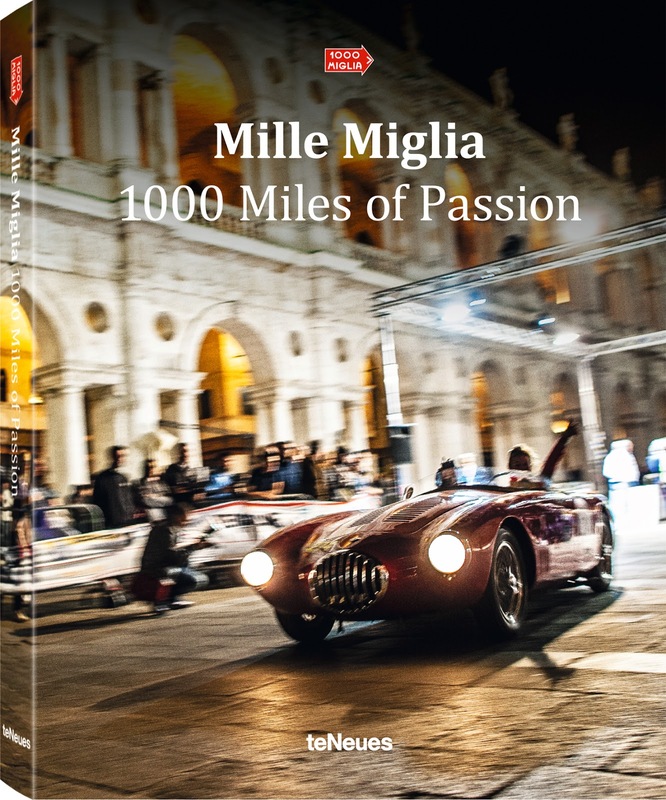 There was also a documentary made about the Mille Miglia in 2007 that you can watch entirely on YouTube. 1000 Miles of Passion is 272 pages with 150 color photos (and another 60 black and white). It's spendy, but that's because you don't skimp on something this beautiful. Add it to your wishlist, beg your family for a birthday gift, save your dollars. Watch the short video below to see the kind of cars in this race and dream about one day attending this wonderful event. Hey guys, look who's back! I have to apologize for my long absence, but school has been a grind this year and between that and my own writing, doing a proper review has been difficult. I'm in the midst of reading a darn fine book that I'm holding off to review until June because I'm not quite done with it. 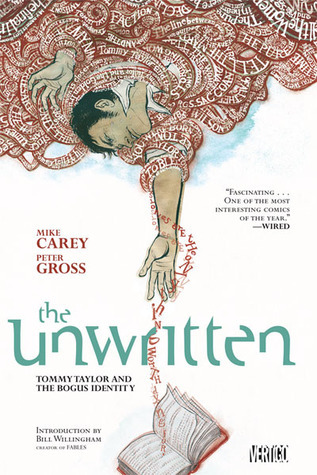 Instead, I'm going to review a series of graphic novels called the Unwritten by Mike Carey. The story in Scott Sigler's new book, Alive, is one which relies heavily on big secrets and big reveals. Don't worry, I'm not going to spoil any of them.